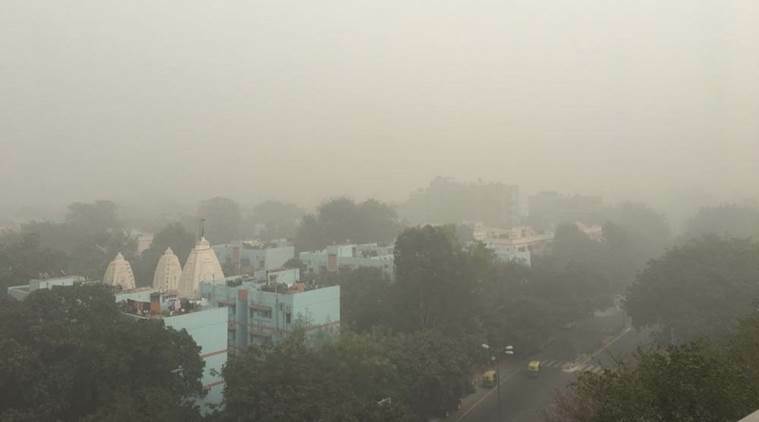 Delhi air pollution live updates: Deputy Chief Minister has appealed to the people in the city to avoid venturing outside, in the wake of high pollution levels. Delhi NCR woke up to a smoggy morning on Wednesday, as air quality remained in the ‘severe’ category in several parts of the city. The state government on Tuesday had ordered all primary schools to remain closed and barred outdoor activities for children in the wake of the pollution. Chief Minister Arvind Kejriwal, who described Delhi as a “gas chamber”, reviewed the situation in a meeting with health and environment officials. The Delhi government is “prepared” to re-launch its odd-even transport scheme and restrict trucks from entering the city in the case of an “emergency,” deputy CM Manish Sisodia said. The government also issued a health advisory for residents of the capital, especially children, the elderly and those suffering from asthma and heart ailments. “We appeal to the people of Delhi to avoid morning and evening walks,” Sisodia had said yesterday. 10:15 pm: PayU company is working on an action plan for its employees to overcome the hazardous pollution. Work from home policy will be implemented if the situation doesn’t improve till Friday. In the meanwhile, the company will be providing masks to all the employees. It will also arrange special plants like snake and peace lily plants inside office to curb the toxic levels. 9:45 pm: Delhi’s deteriorating air quality level has prompted authorities to order an immediate halt on civil construction works. The decisions were approved by Lt Governor Anil Baijal in a meeting which was also attended by Chief Minister Arvind Kejriwal and EPCA (Environment Pollution Prevention and Control Authority) member Sunita Narain among a host of senior officials. 9:10 pm: Transport Minister Kailash Gahlot said that the Delhi government will implement odd-even rule if the air pollution levels persist in ‘severe plus’ category for next 48 hours. The Delhi Transport Corporation has been asked to hire 500 buses in short-term basis and Delhi Metro Rail Corporation (DMRC) has been asked to procure 300 buses to handle the rush if and when odd-even scheme is launched. ‘severe’ levels of pollution, which can affect even healthy people and “seriously impact” those with existing diseases. People are seen buying masks to prevent themsevlves from smog in New Delhi on Wednesday. Express Photo by Praveen Khanna. 8:40 pm: Slamming the AAP government, three political leaders distributed masks to people in the city in wake of rising pollution levels. Shiromani Akali Dal MLA Manjinder Singh Sirsa was joined by Shiromani Akali Dal MLA Manjinder Singh Sirsa at Connaught Place. “The city is facing severe air pollution for the past two days, but Kejriwal has failed to take any steps except for tweeting and writing letters,” Sirsa claimed. Like Jan last year, all eyes on what SC does: will its in-house gender panel act? 8:25 pm: Parking fee hiked: In view of severe air pollution and to restrict personal vehicle usage, Lt. Governor Anil Baijal directed Municipal Corporations, DDA and DMRC to enhance parking fees by four times. 8:15 pm: 18 vehicles slammed into each other on the Yamuna Expressway near Mathura due to poor visibility owing to dense smog layer on Wednesday morning. 8:00 pm: Delhi Lieutenant Governor Anil Baijal has directed the government to stop entry of truck traffic into Delhi. Only trucks carrying essential commodities will be allowed. 7:45 pm: The Centre has asked the Delhi Metro to increase the frequency of trains to encourage people to use public transport in the wake of heightened pollution levels. Housing and Urban Affairs Minister Hardeep Singh Puri asked DMRC Managing Director Mangu Singh to deploy additiona ticketing operators and customer facilitation agents to mak metro travel easier for commuters, the ministry spokesperso said. 6:55 pm: The Delhi government has adviced Delhiites to avoid personal transport. It has issuead health advisory urging people to use carpooling and and public transport, stay indoors, and not to smoke. “Keep the environment healthy, not only by words, but also by your actions. If you feel irritation in the throat and nose, take steam and do salt water gargles. Drink plenty of warm water and maintain good hydration. “If any time you are feeling breathlessness or palpitation, immediately go to nearest medical facility. Do not smoke, as it harms not only you but others also,” the advisory said. 5:00 pm: As air pollution reached alarming levels in the national capital, there was a spurt in fresh cases in hospitals and conditions of patients with history of asthma, Chronic Obstructive Pulmonary Disorder (COPD) and cardio-vascular diseases deteriorated. While people were seen wearing masks to protect themselves outdoors, the city hospitals witnessed a surge in the number of patients complaining of respiratory problems with doctors saying some may develop life-threatening conditions. 4:50 pm: The traffic advisory has issued precautionary measures for motorists to avoid accidents and related injuries as the fog has advanced. Here are the Do’s and Don’ts. 1. Check weather forecast before starting the trip. 2. Delay the ride, If there is a fog warning. 5. Make sure the full lighting system of your vehicle is turned on. 6. Use your low –beam headlights, High beams reflect off the moisture droplets in the fog, making it harder to see. 7. If you have fog lights on your vehicle, use them, in addition to your low-beams. 8. Use pavement marking to help guide you. Use the right edge of the road as a guide, rather than the centre line. 9. Keep your windows and mirrors clean. Use your defroster and wipers to maximize your vision. 10. If the fog is too dense to continue, pull completely off the road and try to position your vehicle in a safe parking area. Turn on your emergency flashers, in addition to keeping on your low-beam headlights. 1.Avoid speeding up suddenly during fog. 2.To avoid collision, don’t stop on the travelled portion of the road. 3.Don’t speed up to pass a vehicle moving slowly or to get away from a vehicle that is following too closely. 4. Do not overdrive your headlights. 4:00 pm: Chief Minister Arvind Kejriwal sought a meeting with his counterparts in Punjab and Haryana to discuss ways to tackle the alarming air pollution levels in Delhi on Wednesday. In letters to the chief ministers of Haryana and Punjab, Kejriwal said the governments in the neighbouring states had failed to provide farmers with viable alternatives to stubble burning, a process that leads to air pollution in Delhi. Share your concern over stubble burning and pollution @ArvindKejriwal, Centre alone can solve the problem given its national implications. 3:50 pm: Dense smog continues to engulf the national capital, visuals from Delhi’s RK Puram. 12.20 pm: The National Green Tribunal seeked explanation from pollution control boards of Punjab, Haryana, UP and Rajasthan as well as Central Pollution Control Board and Delhi Pollution Control Committee on action taken to curb the menace of air pollution in the areas. The NGT had rapped the governments of Delhi, Haryana and Uttar Pradesh fore not taking effective steps to improve the air quality in the area. “The ambient air quality is so bad that children are not able to breath properly. Why didn’t you not spray water using helicopters as per our direction? You take instructions and inform us day after tomorrow.” The tribunal was hearing a plea seeking immediate action in the capital. 11.20 am: Wondering why experts are worried about the increasing pollutants in the air? Well, this is because they can affect your lung function and can also result in respiratory problems like asthama, COPD. The particles can also cause heart attack or stroke. Apart from this, continuous exposure can lead to skin diseases, chironic cough and shortness of breath. 10.30 am: According to CPCB, Air Quality Index (AQI) level 100 is satisfactory. Delhi’s AQI usually ranges between 300 to 400. However, yesterday most places in Delhi had crossed the level of 440, making it the most polluted day of this winter. Last year after Diwali, the levels had reached AQI of 500 (highest), leading to an alarming situation in the city. 10.21 am: Smoke from stubble burning in parts of Punjab and Haryana introduced moisture in the air and turned the city into a “gas chamber.” The Environmental Pollution Control Authority (EPCA) announced a series of preventive measures including, slashing of metro fares and quadrupling the parking fee in the city. 10.10 am: According to Indian Medical Association, the situation in the city is better than yesterday. “PM10 is still at a dangerous level, but it is lesser than yesterday. Precautions recommended for two more days, try to stay indoors, do not go out for exercise or walks,” Dr. KK Aggarwal, president of Indian Medical Association said, reports ANI. IMA on Tuesday, had declared Delhi as “public health emergency.” It has also asked the government to cancel the Airtel Delhi Half Marathon that is scheduled in the city. 9.35 am: A lot of people in the city are seen wearing masks and carrying inhalers. 9.25 am: As per SkymetWeather, the visiblity at airport is very bad and, as a resuly, flight delays are expected. In case you are flying, check out the flying status with the airline before heading out. 9.03 am: Harayana government has also decided that all government, government aided and unaided private schools will open an hour late till November 30 because of the dense smog in the state. The schools will now open at 9 am instead of 8 am. 8.57 am: Delhi Chief Minister Arvind Kejriwal on Twitter said that he is going to write letters to the chief ministers of Punjab and Haryana and request a meeting to find solution to crop burning. 8.50 am: All schools in Ghaziabad have also been ordered to stay closed by the district magistrate because of the worsening pollution levels in the NCR region. District Magistrate Ritu Maheshwari also announced that all construction activities in the region would reamin suspended for atleast a week. 8.35 am: As per Skymet, a private weather forecasting agency, the air quality is going to remain the same in Delhi for atleast the next two days. 8.20 am: Air quality levels in areas like Lodhi Road continue to be in the ‘severe’ category, with high levels of pollutants PM10 and PM2.5 in the air. 8.15 am: A blanket of smog has engulfed the city on Wednesday as well. 8.05 am: Welcome to our live blog on the air pollution in Delhi NCR. We will be tracking air quality and bringing you all the updates from the National Capital Region.